Hibernate Tools provides easy generation, testing and prototyping of your Hibernate or JPA mapped projects. Use it to Run queries, browse mappings and generate code for your data projects. Hibernate added improvements over the years, including changes and additions. Hibernate Tools supports all the major versions. It also support the three variations for previous versions of Hibernate: core for hbm.xml, annotations for hibernate annotations and JPA for Java Persistence style projects. 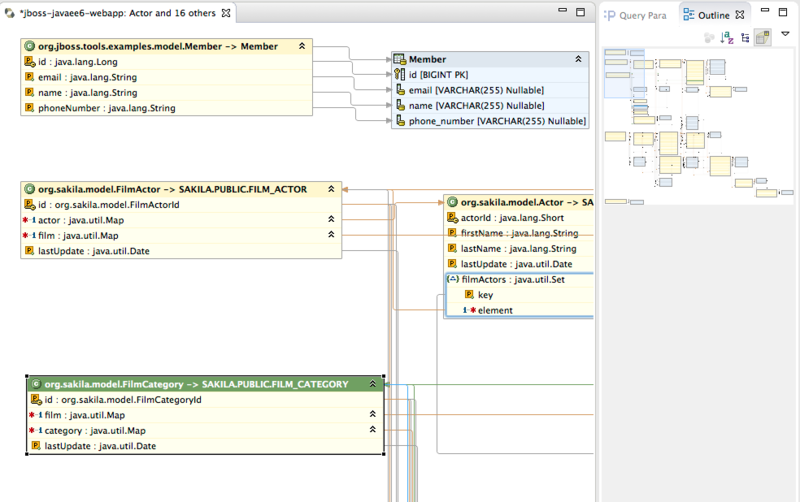 You can choose to use the database connection info from raw Hibernate setup, the JPA project connection info or an already existing database connection available from Eclipse DTP. Hibernate Tools provide a code generation launch configuration which can take the configured Hibernate model and use for various code generation tasks. 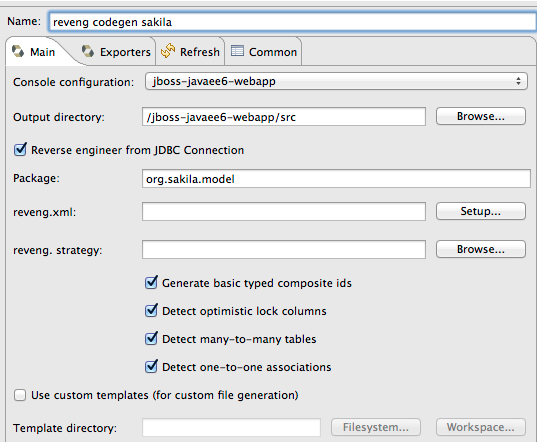 Since it is a launch configuration it is easy to run it repeatedly while developing via the Launch Configuration menu. When reverse engineering you have control over various global aspects of the translation from your database to the persistence model. For example wether optimistic locking should be detected and used, making columns that look like they are an version or timestamp will be used for optimistic locking. Wether many-to-many tables should be detected or mapped as one-to-many instead. Finally if you want full control you can provide a reveng.xml file or even a class that implements ReverseEngineeringStrategy giving you even more finegrained control. The Exporters allow you to generate various unique artifacts in bulk. For example to generate Java, old hbm.xml mappings and schema documentation in one go. Each of the exporters can use the globally configured options or you can choose to override/customize them in the properties section. The console allows you to setup multiple hibernate projects and for each for them browse your model (Configuration/Session Factory) and the actual database. 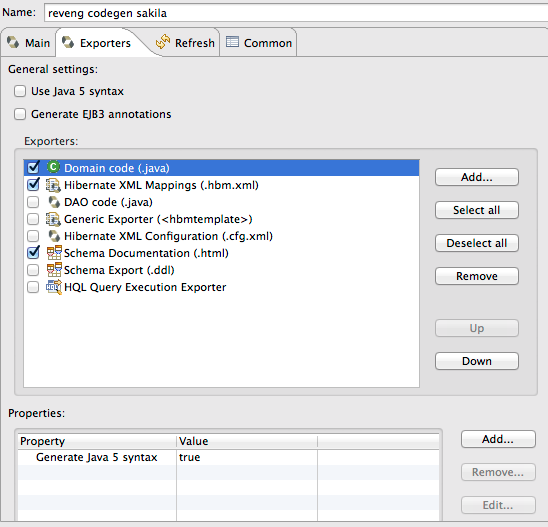 From the console configuration you can access "Hibernate Mapping Diagram". It gives you a readonly overview of your model. The view can be zoomed in and out for viewing details or getting an overview. You can use the outline view to more easily navigate larger models. 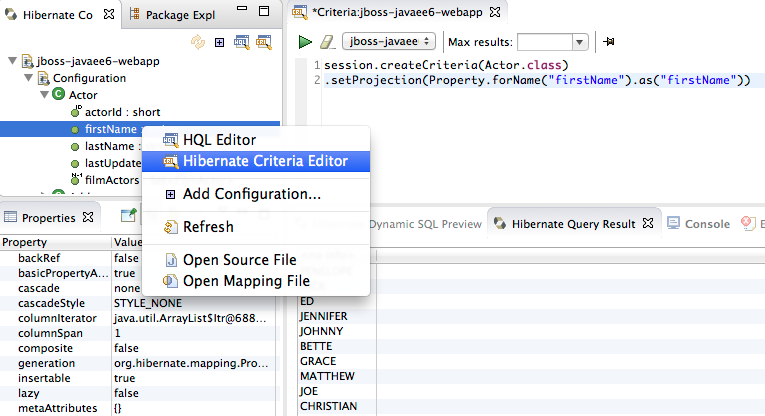 In the HQL editor you can prototype your HQL queries and see the result in the Hibernate Query Result viewer. Ever wondered what SQL Hibernate actaully executes for a given HQL ? 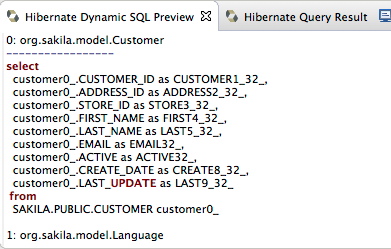 With 'Hibernate Dynamic SQL Preview' you can see a live preview of the SQL for the HQL you are editing. Allowing you to fine tune your queries more easily. 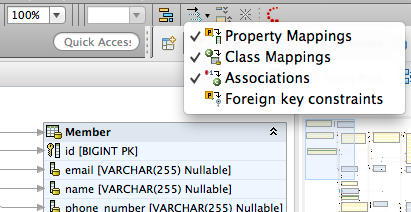 With the Criteria Editor you can use the full power of the Java language. Right click on an Entity or property, choose 'Criteria Editor' and the editor will be pre-filled with the Criteria code needed for querying it. 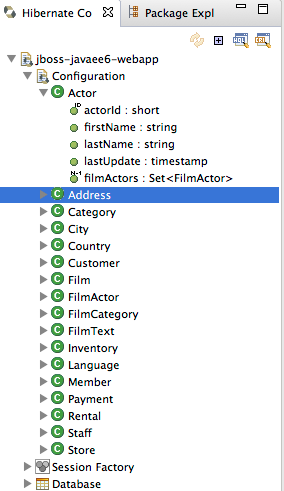 The Criteria editor auto imports all the Hibernate classes and your model classes and it will visualize the last returned java object. If the returned object is a query or criteria it will execute it before visualizing it. The hbm.xml source editor provides content assist for xml with java classes, properties and hibernate types. 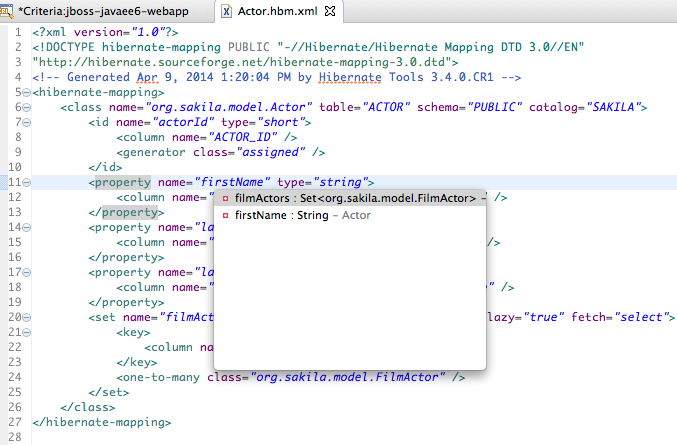 The tree tab in hbm.xml editor provides form based access to your hibernate hbm.xml mapping files. 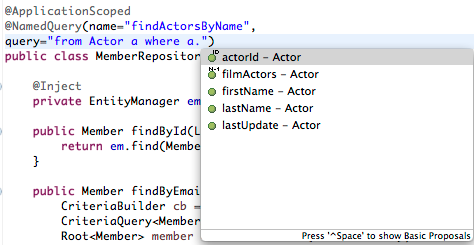 For @NamedQuery Hibernate Tools provides HQL completion and validation. No need to leave the java editor. On HQL and Criteria code in the java editor you can use Quick fix to copy the current HQL or Criteria string to the full editor. Here you can edit, run, experiment with the query and when done saving the editor will update the query or criteria in your java code. 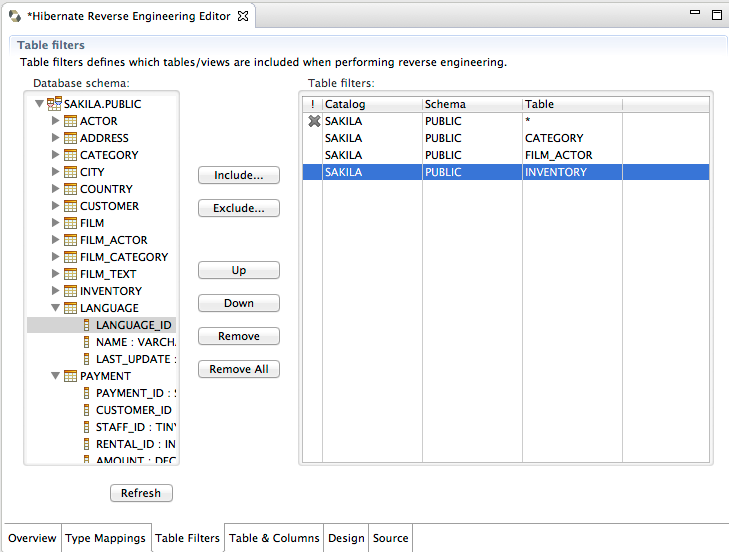 The reveng.xml wizard and associated editor allow you to tweak many aspects for controlling the reverse engineering.